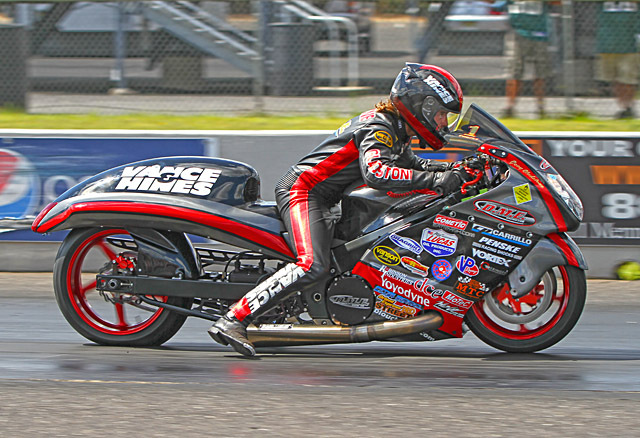 North Carolina-based DME Racing traveled a little further north than usual last weekend, to New Jersey’s legendary Atco Dragway for the MIROCK Superbike Series’ 45th annual Orient Express Motorcycle U.S. Nationals. But the result was the same—another all-DME, Orient Express Pro Street final. Champion Joey Gladstone again took the win, but teammate Terence Angela took the tree and seemed poised to take the stripe as well until Gladstone powered around. Champion Joey Gladstone again took the win, but teammate Terence Angela took the tree and seemed poised to take the stripe as well until Gladstone powered around. 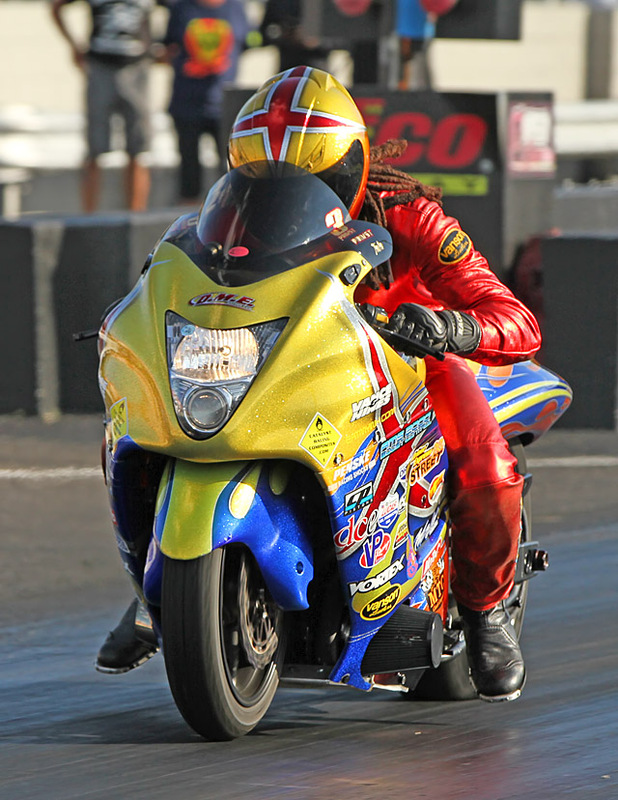 With a broke bye to start his day, Gladstone faced only DME teammates Angela and Jason Dunigan and their turbocharged Suzuki Hayabusas in eliminations. 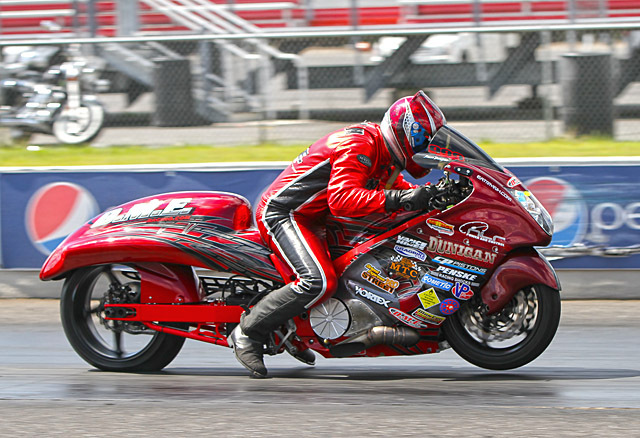 Gladstone had something for them both, and again ran a 6.90 in eliminations—stoking anticipation for the first 6.80 streetbike pass. Joey also reset the MPH record at 219.86. The win brought it all back home for Gladstone, who began his career at Atco when still in high school. 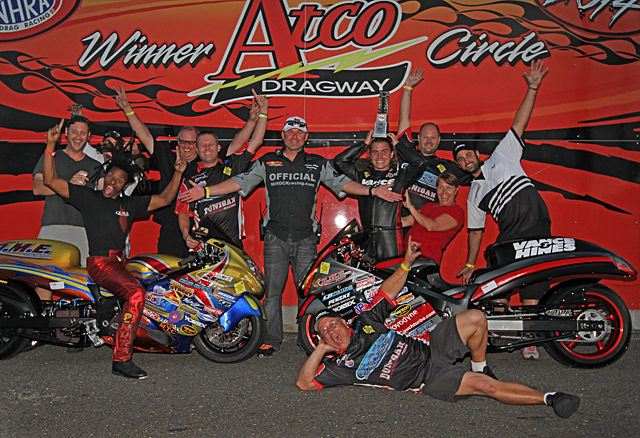 DME Racing took over the MIROCK winner’s circle in Atco, N.J.
Atco wasn’t the only DME win last weekend, as British Super Streetbike champion Steve Venables won the FIM European Finals at Santa Pod on his DME purpose-built chassis, E85 fueled, turbo ‘Busa. “After the disappointment in Hockenheim due to the poor track conditions, we went to the Euro Finals with new determination and hoping to regain our normal form,” said Venables. Venables tested with a best of 7.21 at 202 mph and qualified with same, just behind number 1 qualifier Shaun Buttigieg’s 7.20. Venables raced past Erich Gruber and Daniel Lencses to face teammate Graham Balchin in the semifinals. It was a close race from start to finish, with Venables’ DME power and handling taking the win with a 7.27 to Balchin’s 7.29. 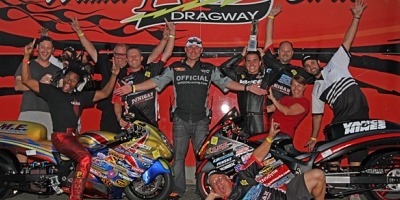 DME races next with the MIROCK Superbike Series at Maryland International Raceway for the 22nd Annual Fast by Gast Fall Nationals featuring the awesome $10,000-to-win Orient Express Pro Street Battle Royale on October 3-5, 2014. DME—like everyone lese—will be racing for the big check and the sport’s first 6.80 street tire pass.